Kurnool, Feb 26: Here is the latest news that, Konda Reddy fort in Kurnool, a National Monument, was subjected to vandalism by fans of movie star turned politician Pawan Kalyan at a meeting held by the Janasena party on Sunday. 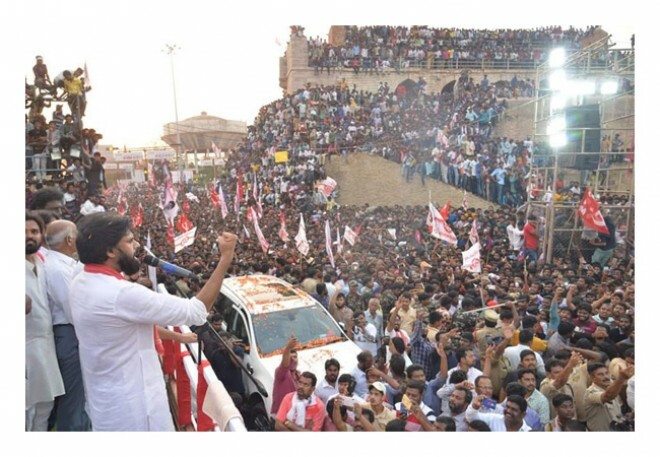 Over one thousand people barged into the fort climbing its walls and barricades and brandishing Janasena flags. More than 200 flower pots were crushed and steel railings were found twisted and benches had been damaged causing a loss of an estimated Rs.1lakh. A case has been filed in the II town police station. The Archaeological Survey of India (ASI) said the 12th-century monument was already in a weak state, and if subjected to such rough use it could cave in. An ASI official expressed his surprise that the Konda Reddy fort was chosen as the venue for the meeting and demanded to know how the officials granted permission for Pawan Kalyan's meeting near the fort. The local authorities failed to assess the venue's suitability for the meeting. An ASI official said that the lawns were destroyed and lights were damaged. The fort has 5 regular workers to take care of its upkeep. 10 more temporary employees were hired to tackle the crowd. An ASI official alleged that there are only two policemen sent to help, who did next to nothing in controlling the crowd. The ASI official said, "We were no match for them." The irony is that Pawan Kalyan spoke high of Konda Reddy fort and said that if the fort been in Greece or France, it could have become a heritage structure.